You just can’t keep Doc Ock/Superior Spidey down. It has been a while now since Peter Parker regained his body and mind and defeated Doctor Octopus, but because of the Edge of Spider-Verse event that is happening, we get more issues of SUPERIOR SPIDER-MAN. Which is not a bad thing in the least, because as we learn in this issue, Superior Spidey is a singular being. For those of you not following this Spidey-centric event, I will help you along a little. 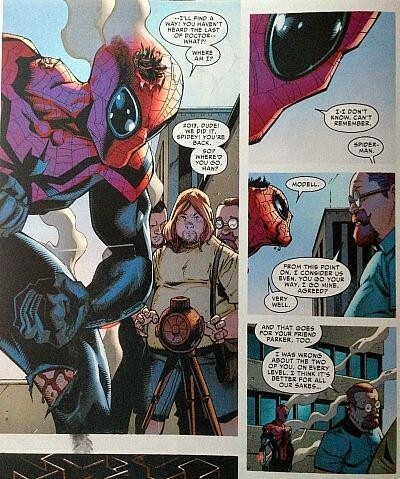 Back in Superior Spider-Man, there was an accident that made Spidey kind of ‘blip’ out for a few hours. When he returned, Doc Ock/Superior Spidey was happy to be back in his own time, though could not remember where he was, as that would be a story for a different day. That day is now, as the events that are unfolding in Edge of Spider-Verse titles are explaining just what happened our brain-swapped hero at that time. Where is my daughter Ariel!!! The great reveal is that we finally learn who is behind the diving mask in this issue. Minor spoiler: it’s a brand new character, not one from Spider-Man’s incredible rogues gallery. Which is a great story point, and Christos Gage, with the oversight of Dan Slott, pulls off very nicely. They don’t dangle the info in front of us either, rather giving us a comprehensive and informative origin story to boot!. Also, seeing multiple versions of Spidey running around, especially Assassin Spider-Man and Monkey Spider-Man, makes for a fun comic. Guiseppe Camuncoli lays down great pencil work for John Dell’s inks and Antonio Fabela’s colors. The crazy amounts of blues and reds could get away from anyone with this many spider-people running about, but the pages all look great. This event is shaping up to be something really special. 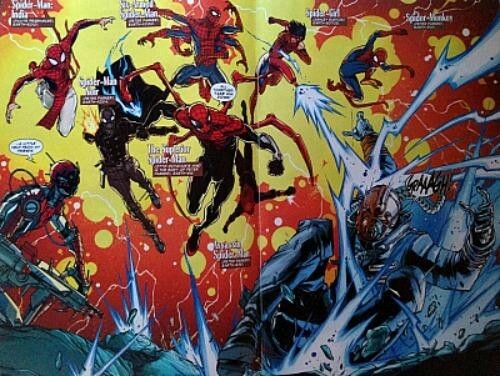 Seeing all the different Spider-Men all working together isn’t too heavy handed, and it really hammers the point that Doc Ock/Spidey is a singularity. There is no other Spider-Man like him, and he truly deserves the name Superior, at least in this instance. Also, seeing Spider-Girl, a.k.a. Ashley Barton, pop up from the Old Man Logan line makes me smile big and wide. I hope that this event stays on course, because with each Edge of Spider-Verse, book that comes out, more and more spidey like people are introduced, and it could get off the rails rela quick. But like I have said in the past, I trust Dan Slott with the webhead, because he has a great track record thus far. CBH Score: 4 out of 5. 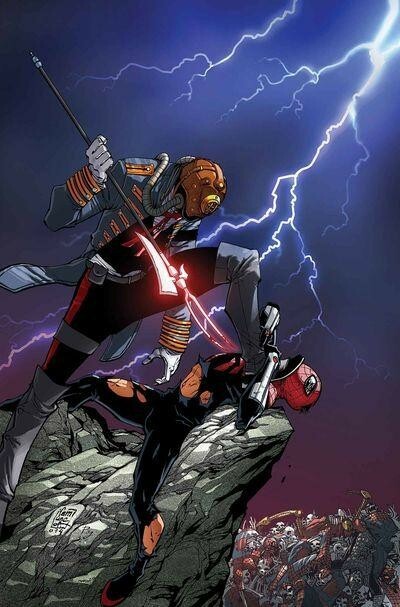 Interesting read, definitely happy to see Doc Ock/Superior Spidey back in full action again.